After three separate failed attempts at writing a review of The Owls of St. Ursula’s, I looked at my list of books read and decided I had enough for a catch-up post, even though I feel like all I’ve done lately is reread the Hildegarde-Margaret books. Read the rest of this entry ? I don’t know what it says that this is the second time I’ve gotten this far in the series and stopped reading. Possibly that it ought to have ended here? Margery and Laura return home, the two romantic storylines are resolved, and there’s a description of waiting for election results that I found much more interesting and much less depressing last time I read it. I really, really like Grace S. Richmond, guys. This is a very episodic book about a doctor who lives in the suburbs, and how hot and honorable and good at surgery he is. He also adopts a small child and drives his car very well and falls in love with a widow instead of the flashy young woman who’s falling all over herself to attract him. If you are a person who should read this book, every one of those items will have piqued your interest. I also listened to audiobooks of Aunt Crete’s Emancipation, Stalky & Co., and Grace Harlowe’s Golden Summer. Aunt Crete’s Emancipation, read by Cori Samuel, is my favorite thing I’ve listened to from LibriVox. At first I was a little thrown off by hearing an American book in an English accent, but Samuel is a really good reader, and somehow this was just a really fun story to listen to. Stalky & Co., read by Tim Bulkeley, didn’t really work for me. This is one of my favorite books, and Bulkeley is a perfectly competent reader, but…I don’t know. I think the biggest problem was that I found the character voices silly and distracting. Grace Harlowe’s Golden Summer was read by ashleighjane, who’s done a bunch of other books in the series. I listened to it to reorient myself in the series, thinking I’d move on to later books I haven’t read before, but it was…uninspiring. Like, I don’t have specific complaints. It was fine. But it did not make me want to read the next book. *Calling your reps is a good thing to do no matter what your political affiliation is, but if you’re pleased with our new authoritarian government, why are you here reading a blog about books that emphasize things like honor and truth and charity? Sometimes I read a book and know exactly what I want to say about it, and writing about it is easy and fun. Other times, it’s a struggle. I don’t know what I think of the book, and I write about five half-posts before I come up with something that says about half of what I wanted to say. I think the real problem here is the structure. There’s pretty much no plot. In the first half of the book, David goes to a school called Helmsworth. In the second half he goes to a school called Marchester. He has some friends. He gets into trouble a couple of times. He plays some cricket. At the end, he gets horribly injured, and the whole chapter feels like it ought to be in a different book. It’s like E.F. Benson just wrote whatever he wanted about his main character, without really bothering to make sure all the parts were related in any significant way. And somehow there’s almost no narrative tension to be found anywhere. Read the rest of this entry ? I suspect that A World of Girls was one of L.T. 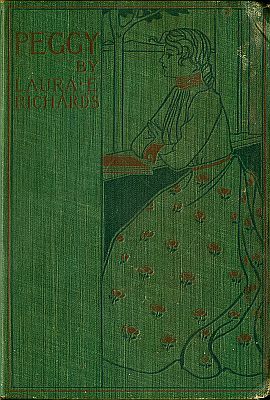 Meade’s most popular books, because it’s the one that shows up most frequently on the title pages of her other books — you know: “by Mrs. L.T. Meade, author of A World of Girls, A Sweet Girl Graduate, etc.” — and that’s kind of why I hadn’t read it until now. But if it was one of her most popular, there’s a reason: it’s pretty good. I kind of love L.T. Meade’s school stories. They’re from a generation or so before the classic English school stories by people like Angela Brazil or, later, Enid Blyton, so the school environment is completely different, with fewer students, a less formal atmosphere, and different kinds of activities. In A World of Girls, the big school playroom is lined with little partitions diivided from the rest of the room by railings and curtains, and older girls who are very good get their own partitions to furnish as they like and invite other girls to drink tea in. Read the rest of this entry ? Peggy’s book, which is just called Peggy, is the best in the series so far, and not just because I’m a sucker for a good school story. Peggy was the kind and strong but sort of stupid one in Three Margarets, but she really comes into her own here, in her first year at boarding school. Read the rest of this entry ? I’ve spent the past week writing the first draft of my thesis, which is why I haven’t updated. But although I may stop writing here, I never stop reading, and one of the things that made working on my thesis the most difficult was that I became completely absorbed in reading the first few Betty Wales books. I had a very strong sense of déjà vu all the way through the first half of Betty Wales, Freshman and then again through the second half of Betty Wales, Sophomore, and I’m still not sure whether I’ve read them before or whether it’s just because these college girl books are all so much alike. My best guess so far is that the beginning of Freshman uses a number of incidents that appear in lots of similar books, and that I did at some point — probably about six years ago — read Sophomore. Read the rest of this entry ? I’m kind of surprised to realize that I haven’t posted anything in nearly a month. But although I haven’t been writing, I’ve definitely still been reading. Last week, for example, I raced through The High School Girls Series and The College Girls Series, which were published under the name Jessie Graham Flower, the pseudonym of a woman named Josephine Chase. These are the first two of four series about a girl called Grace Harlowe. In the first series she’s the ideal type of high school girl, and in the second she’s the ideal type of college girl. I can only assume that in the third she’s the ideal type of girl who hangs out with the American army in Europe during World War I — it’s called Grace Harlowe Overseas — and in the fourth, well, I’m not quite sure. What is an Overland Rider?